The processes of gemination, lenition, and vowel lengthening are central to the study of phonology, as they reveal much about the treatment of quantity in a given language. Using data from older language stages, modern dialects and standard languages, this study examines the interdependence of vowel and consonant quantity in the history of the Germanic branch of Indo-European. Kurt Goblirsch focusses on the various geminations in Old Germanic languages (West Germanic gemination, glide strengthening, and expressive gemination), open syllable lengthening in German, Dutch, Frisian, English, and Scandinavian languages, and the major lenitions in High German, Low German, and Danish, as well as minor lenitions in Bavarian, Franconian, and Frisian dialects. All of these changes are related to the development of the Germanic languages from distinctive segmental length to complementary length to syllable cut. 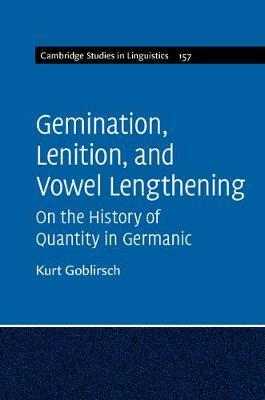 The discussion challenges traditional theoretical assumptions about quantity change in Germanic languages to argue for a new account whereby, gemination, lenition, and vowel lengthening are interrelated.